Agricultural irrigation has been one of the key activities for achieving food security throughout history. The text reviews the most recent research results on common types of irrigation methods, systems and their impact in specific socio economic or climatic environments. The relation of water resources and irrigation is described in more detail, including the impacts of irrigation methods on water resources. Finally, you can read about the role of policy, research, technologies and management to improve water use efficiency in irrigation. 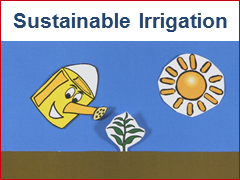 The goal is to avoid water scarcity caused by irrigated agriculture and to find sustainable irrigation solutions. This is a working paper. An updated version is published as part of RUVIVAL Publication Series Volume 3. Water Efficiency in Agricultural Irrigation by Monina Orlina and Ruth Schaldach is licensed under a Creative Commons Attribution-ShareAlike 4.0 International License. Water may seem abundant, but less than one percent of the world’s water is readily accessible for human needs. One proposed solution to fight this water scarcity and stress, and include local factors into the equation, are water harvesting practices, and more specifically Rain Water Harvesting (RWH). Learn more in this Rainwater Harvesting Literature Review. UPDATE: The updated version of this literature review is part of RUVIVAL Publication Series Volume 2. A working version of this paper was previously published on RUVIVAL. It can be read here. The utilisation of urine has showed many advantages according to different researchers and projects undertaken in different countries. However, even though hygiene quality is normally very high compared to faeces, certain risks still exist. Learn what the advantages and risks are and how they can be managed in this Urine Utilisation Literature Review. Urine Utilisation in Agriculture by Andrea Munoz Ardila, Maryeluz Rueda Morales, Ruth Schaldach and Joachim Behrendt is licensed under a Creative Commons Attribution-ShareAlike 4.0 International License. What are aquifers and why are they important? How does aquifer recharge occur? What can be done to enhance it? Which implications does this have for arid and semi-arid regions? 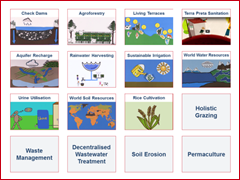 To answer all these questions and more, please have a look at the Aquifer Recharge Literature Review below. This is a working paper. 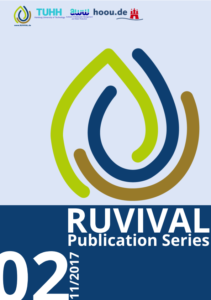 An updated version is published as part of RUVIVAL Publication Series Volume 2. Aquifer Recharge by Berenice Mendez Lopez and Lukas Huhn is licensed under a Creative Commons Attribution-ShareAlike 4.0 International License. This Terra Preta Sanitation literature review introduces the current state of the art of this dry sanitation system. The text will enable you to dive deeper into the topic and processes that entail this dry sanitation solution. These are Lactic acid fermentation and Vermicomposting by earth worms. Case studies in India, Phillipines and Ethiopia, where TPS systems have been implemented are also introduced, along with their most significant research outcomes. A Review of Terra Preta Sanitation with a Focus on the Research Outcomes of TUHH Dario Fröndhoff, Ruth Schaldach, Ralf Otterpohl is licensed under a Creative Commons Attribution-ShareAlike 4.0 International License. For further information on Terra Preta Sanitation, click on the element below. In this Living Terraces literature review, we will discuss the role of living terraces in erosion control and rainwater harvesting. The concept of living terraces is a combination of several erosion control methods. It aims to minimise the needed workload and begins to be productive soon after establishment. The entire structure, with both vertical and horizontal elements, is made out of living trees. This greatly increases their stability and durability. We will first introduce you to conventional erosion control measures – hedgerows, swales and terraces. The literature review will also explain proper building practices and propose suitable plant species. This literature review is part of our RUVIVAL Publication Series Volume 1 (page 14.). This agroforestry literature review will provide you with additional information on the concept of agroforestry and its benefits, but also challenges. In addition, we will introduce you the Slope Farming Project in Arba Minch, Ethiopia. This project is currently developed as a collaboration between Hamburg University of Technology and the Arba Minch University. This literature review is part of our RUVIVAL Publication Series Volume 1 (page 6). 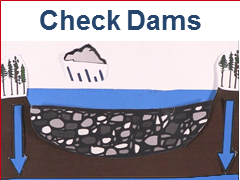 In this check dams literature review you will get a chance to learn more about check dams, their classification, as well as advantages and disadvantages. You will also learn about the basic construction guidelines and design recommendations, but also about practices that should be avoided. Finally, you will be introduced to a case study of the Loess Plateau of China, which is a good example of potential advantages and disadvantages of a consistent number of check-dams in a severely eroded site. This literature review is part of our RUVIVAL Publication Series Volume 1 (page 20).